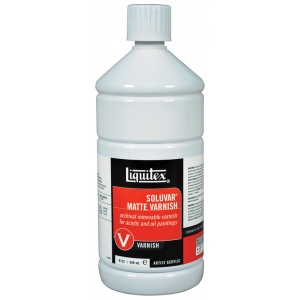 * Apply as a final varnish over dry acrylic or dry oil paint. * Increases the depth and intensity of color. 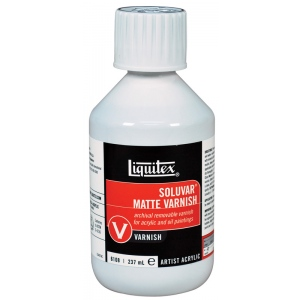 * Permanent removable final varnish for acrylic and oil paintings that protects painting surface and allows for removal of surface dirt without damaging painting underneath. 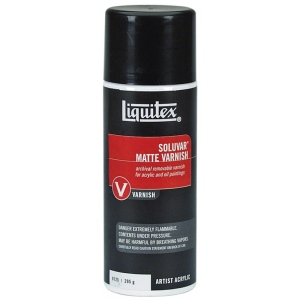 * Once surface is clean a new coat of Soluvar may be reapplied to surface. * Thin with mineral spirits or turpentine but do not use odorless mineral spirits. * Dries to a clear non-tacky water resistant hard film that is resistant to retention of dirt and prevents dirt and pollutants from contacting paint surface. * Self-leveling will not hold brush strokes. * Flexible will not crack as surface expands and contracts during temperature and humidity changes. * Resists discoloring due to humidity heat and ultraviolet light. * Protects painting against harsh elements. * For interior and exterior use.